The Cached Table example shows how a table view can be used to access a database, caching any changes to the data until the user explicitly submits them using a push button. The example consists of a single class, TableEditor, which is a custom dialog widget that allows the user to modify data stored in a database. We will first review the class definiton and how to use the class, then we will take a look at the implementation. 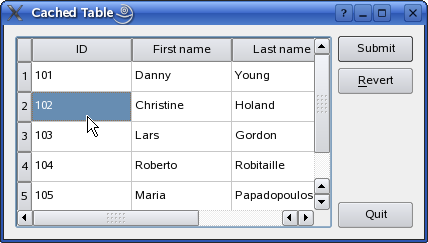 The TableEditor class inherits QDialog making the table editor widget a top-level dialog window. The TableEditor constructor takes two arguments: The first is a pointer to the parent widget and is passed on to the base class constructor. The other is a reference to the database table the TableEditor object will operate on. Note the QSqlTableModel variable declaration: As we will see in this example, the QSqlTableModel class can be used to provide data to view classes such as QTableView. The QSqlTableModel class provides an editable data model making it possible to read and write database records from a single table. It is build on top of the lower-level QSqlQuery class which provides means of executing and manipulating SQL statements. We are also going to show how a table view can be used to cache any changes to the data until the user explicitly requests to submit them. For that reason we need to declare a submit() slot in additon to the model and the editor's buttons. The createConnection() function is a helper function provided for convenience. It is defined in the connection.h file which is located in the sql example directory (all the examples in the sql directory use this function to connect to a database). qApp->tr("Unable to establish a database connection.\n"
query.exec("create table person (id int primary key, "
query.exec("create table trolltechoffice (id int primary key,"
"'Oslo is home to more than 500 000 citizens and has a "
"lot to offer.It has been called \"The city with the big "
"'Brisbane is the capital of Queensland, the Sunshine State, "
"where it is beautiful one day, perfect the next.  " "Brisbane is Australia''s 3rd largest city, being home "
"values(2, 2, 'Redwood City', 'US',"
"'You find Redwood City in the heart of the Bay Area "
"just north of Silicon Valley. The largest nearby city is "
"San Jose which is the third largest city in California "
"'Berlin, the capital of Germany is dynamic, cosmopolitan "
"and creative, allowing for every kind of lifestyle. " "East meets West in the metropolis at the heart of a "
"'Several technology companies are represented in Munich, "
"and the city is often called the \"Bavarian Silicon Valley\". " "The exciting city is also filled with culture, "
"'Beijing as a capital city has more than 3000 years of "
"history. Today the city counts 12 million citizens, and "
The createConnection function opens a connection to an in-memory SQLITE database and creates a test table. If you want to use another database, simply modify this function's code. First we create the data model and set the SQL database table we want the model to operate on. Note that the QSqlTableModel::setTable() function does not select data from the table; it only fetches its field information. For that reason we call the QSqlTableModel::select() function later on, populating the model with data from the table. The selection can be customized by specifying filters and sort conditions (see the QSqlTableModel class documentation for more details). We also set the model's edit strategy. The edit strategy dictates when the changes done by the user in the view, are actually applied to the database. Since we want to cache the changes in the table view (i.e. in the model) until the user explicitly submits them, we choose the QSqlTableModel::OnManualSubmit strategy. The alternatives are QSqlTableModel::OnFieldChange and QSqlTableModel::OnRowChange. Finally, we set up the labels displayed in the view header using the setHeaderData() function that the model inherits from the QSqlQueryModel class. Then we create a table view. The QTableView class provides a default model/view implementation of a table view, i.e. it implements a table view that displays items from a model. It also allows the user to edit the items, storing the changes in the model. To create a read only view, set the proper flag using the editTriggers property the view inherits from the QAbstractItemView class. To make the view present our data, we pass our model to the view using the setModel() function. The TableEditor's buttons are regular QPushButton objects. We add them to a button box to ensure that the buttons are presented in a layout that is appropriate to the current widget style. The rationale for this is that dialogs and message boxes typically present buttons in a layout that conforms to the interface guidelines for that platform. Invariably, different platforms have different layouts for their dialogs. QDialogButtonBox allows a developer to add buttons to it and will automatically use the appropriate layout for the user's desktop environment. Most buttons for a dialog follow certain roles. When adding a button to a button box using the addButton() function, the button's role must be specified using the QDialogButtonBox::ButtonRole enum. Alternatively, QDialogButtonBox provides several standard buttons (e.g. OK, Cancel, Save) that you can use. They exist as flags so you can OR them together in the constructor. We connect the Quit button to the table editor's close() slot, and the Submit button to our private submit() slot. The latter slot will take care of the data transactions. Finally, we connect the Revert button to our model's revertAll() slot, reverting all pending changes (i.e., restoring the original data). In the end we add the button box and the table view to a layout, install the layout on the table editor widget, and set the editor's window title. The submit() slot is called whenever the users hit the Submit button to save their changes. First, we begin a transaction on the database using the QSqlDatabase::transaction() function. A database transaction is a unit of interaction with a database management system or similar system that is treated in a coherent and reliable way independent of other transactions. A pointer to the used database can be obtained using the QSqlTableModel::database() function. Then, we try to submit all the pending changes, i.e. the model's modified items. If no error occurs, we commit the transaction to the database using the QSqlDatabase::commit() function (note that on some databases, this function will not work if there is an active QSqlQuery on the database). Otherwise we perform a rollback of the transaction using the QSqlDatabase::rollback() function and post a warning to the user. A complete list of Qt's SQL Database Classes, and the Model/View Programming documentation.